After years of struggling with a lack of flexibility, a torn meniscus lead me down the path of discovering how animals move so well. I thought like many of you, animals naturally stretch. Well, in fact, they actually contract muscles in order to lengthen them. Little did I know a decade later I’d have a book on Amazon explaining what animals do and what we can do to move well for life. 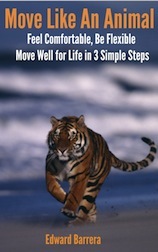 Move Like an Animal is now available on Amazon. You’ll discover what animals do and specific movement patterns to return you to the freedom you once had and can retain as you age. You can reset tension levels through what is called the alpha-gamma coactivation level or loop. Watch below to learn how the somatics exercises uniquely use this very natural resetting mechanism. You can learn how to reset your own loop in 3 simple steps watch this free video to learn how feel great every day.